Protector 13mm Chain Only Discounts Apply ! High security 13mm Hardened boron steel high grade long link medium weight chain (select length below). Sold Secure Bicycle Gold/Motor Scooter Silver. Less secure than the Protector 16mm/19mm chains, but easier to handle/carry. Recommended for medium-high value bicycles and as a motorbike carry chain. Not recommended for motorbike home security. 2.9kg/m. THE ONLY REVIEW YOU NEED TO READ! 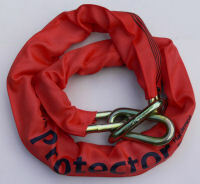 Ground anchor, a 2 Metre x 16mm chain and PIN lock. I have searched the web (eBay, utube, Google, etc.) and I could not find anything better (or equivalent) for cheaper!! Great balance of protection and weight. 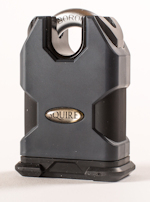 I use them for additional security at home and as a carry chain for portability. A good balance between protection and weight. Ordered on the Monday, delivered on the Tuesday. Great communication too. Chain looks solid. Recommended.